It seems like I regularly review board games that are based on video games, recent ones having been Fallout, Doom and Civilization, but it’s not been often of late that I receive a game based on books. Whether or not that’s due to a shift in culture away from paper to console by the respective target markets, I’ll let you make up your own mind. 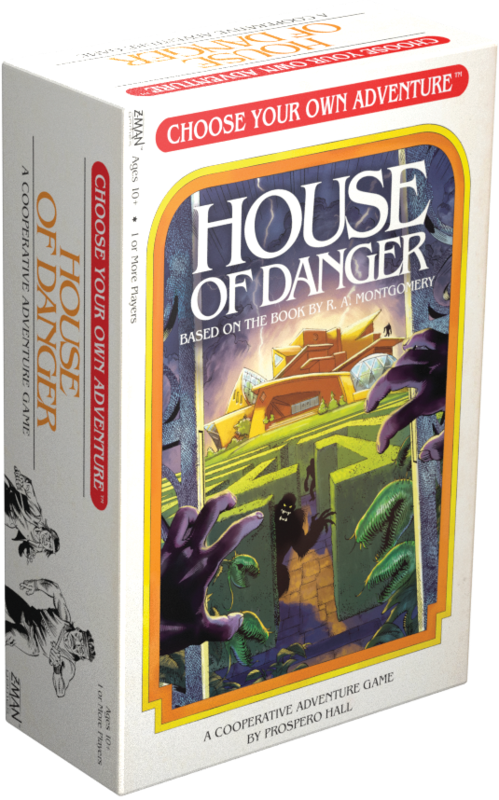 This review, however, breaks that trend as House of Danger comes from the popular 80s & 90s series ‘Choose Your Own Adventure’ books by R.A. Montgomery. Having never read any of the books, I can state from the very beginning that I have no nostalgic ties to this series whatsoever, and I offer my unbiased opinion, so let’s see what it’s all about. Despite the lack of knowledge of the series, I was pleased to see that House of Danger was being published by Z-Man Games, who tend to publish great games. 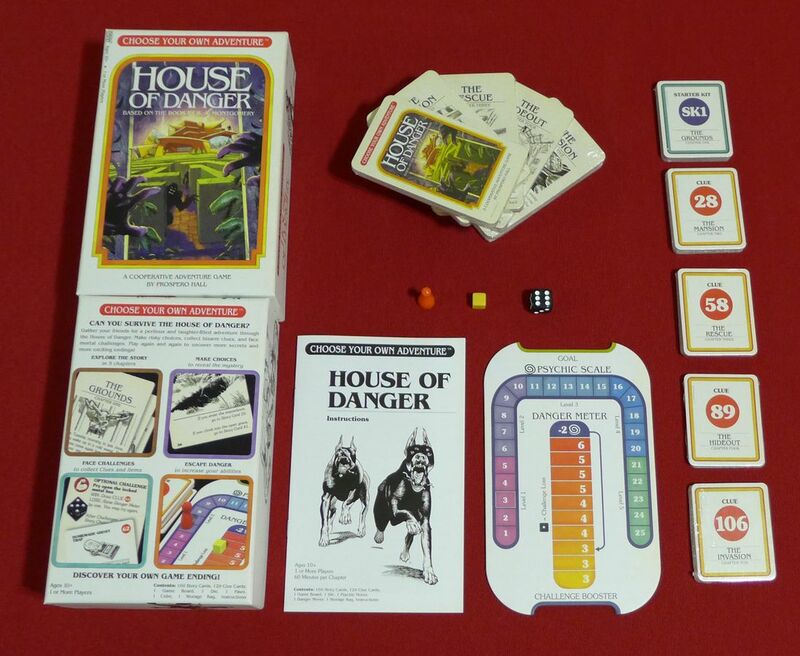 Designed by Prospero Hall, House of Danger is a cooperative game for one to an unlimited number of players and should take around 30 to 60 minutes per chapter, of which there are 5. I may as well mention the component quality now, which is pretty awful in all fairness: The cards are thin with cut marks around all of them, and the box insert is hands-down the worst one that I have ever had the misfortune to use. It’s a misshapen cardboard mess that allows the cards to slip through the gaps between the joins, making it almost impossible to get them back out. As this is a story-based game, I won’t be talking about specifics of the narrative so as not to spoil the experience, so I’ll go straight into how the game is played. 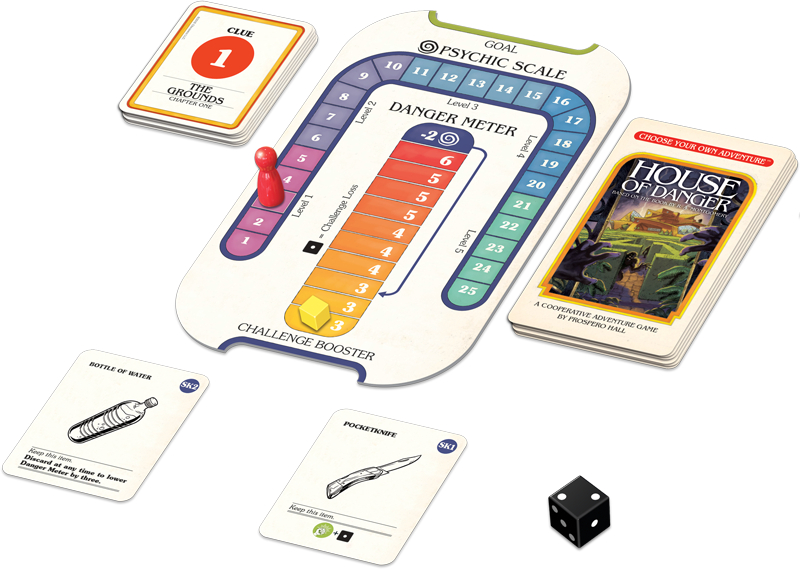 The game does have a small board which is there to track the danger meter and the psychic scale; I realise this means nothing to you as yet, but I will explain. 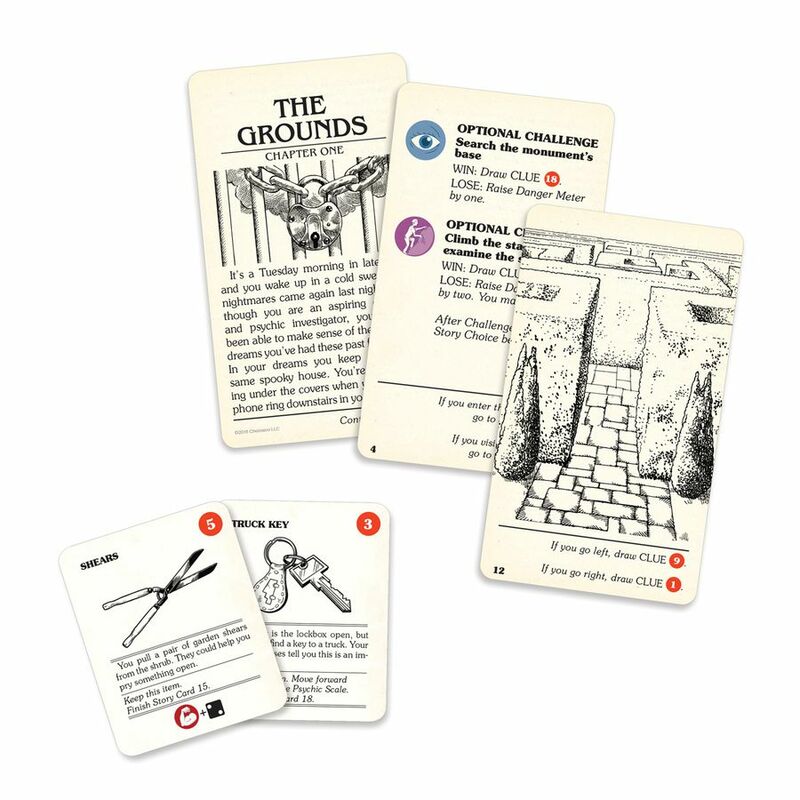 The game comes with two types of cards, which are clue cards and story cards, both of which are separated into the 5 chapters. The story cards are what drive the game forward; each chapter will start with a short introduction which basically sets the scene, and each card will then add to the story and give players choices at the bottom. For example, choose to walk to the gardens and read card 10 or choose to walk to the garage and read card 6. Some cards will give you a clue card number, which the player will then draw, and on the clue card might be an item to help you through the game; it could be a challenge that you need to pass (I’ll come on to them shortly), or it could just add more narrative to the story. As the game progresses, some cards will have an effect on the two tracks, one being the danger metre and the other the psychic scale. The danger metre comes into effect when you roll a D6 for challenges and is ranged from 3-5. 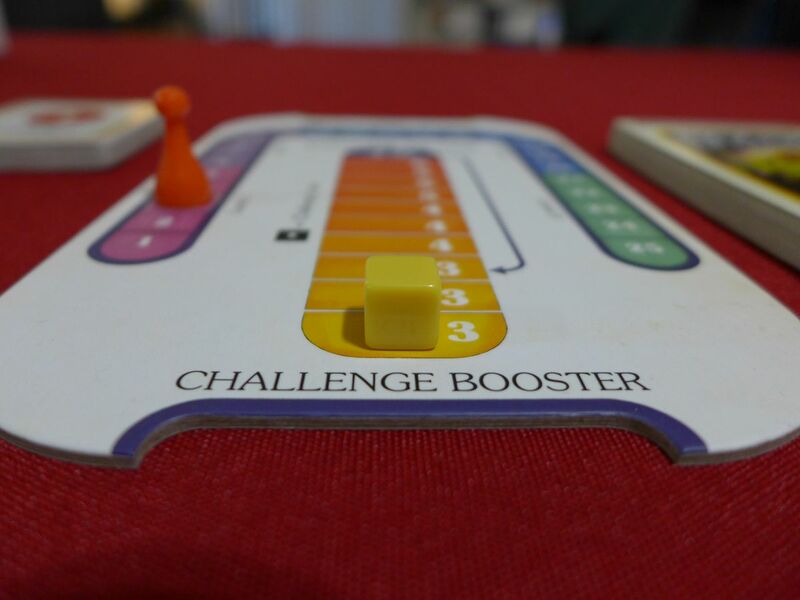 If the danger metre is at 3, then you must roll a 3 or higher to pass the challenge and so on. Once this metre reaches its pinnacle, it resets down to 3 and players lose spaces on the psychic scale. The psychic scale moves back and forth depending on the above and instructions from the story/clue cards. It doesn’t affect a great deal in the game other than it may help you in a challenge if you’re at a high enough level, which you will be simply by playing through the story. A few observations about the game then: I’ve already mentioned that it looks awful and that might be in order to keep the cost down as House of Danger is essential a ‘play once, throw away’ game, but aesthetics are still important for any game, in my opinion. Secondly, what I essentially did for 3 hours whilst playing through the five chapters was read a book. Due to the very nature of the game, there is zero strategy involved: For instance, you might have to make a choice on, say, walking through a door on the left or a door on the right. You have nothing to base that judgment on whatsoever, it’s a straight-up guess, which may mean you discover this new cool weapon, or you may simply end up dying, something that happened to me at several points throughout, I’ll add. On that, dying has no consequences either, you simply go back to the last card and choose the other option; the danger metre might be raised, but that resets when it reaches the top anyway, so what’s the point? By taking away any ounce of strategy or consequence from players, it removes all the fun and replay value for me. My third gripe is the ‘one to multiple’ players guide on the box: I think not, this is a solo game right to its core, any more than one person playing this game simply means that one reads the card then you all debate whether to go left or right, and we all know who wins that argument: the alpha gamer of the group. The two tracks do add a slight bit of ‘game’ into the experience but nowhere near enough to get any sense of achievement once you’re finished. I may play this game again with my children on a horrible rainy November day, if only to teach them the lesson of appreciation that a.) ‘they should play outside at every opportunity’ and b.) ‘other games may not be as bad as we once thought’. I have just reviewed and been pretty underwhelmed by Ticket to Ride: New York which, if I had played after House of Danger, I may have been more favourable with. My overriding feeling whilst playing through this was ‘I’m bored’ and that I didn’t really care what was happening towards the end due to me having no effect on the outcome. What is written will inevitably happen. If the Choose Your Own Adventure books hold a special place in your heart, I imagine you would really like House of Danger. If you have no nostalgia for the series and you want to play a game solo or in a group, then stay clear as I have used the term ‘game’ very loosely throughout this review. 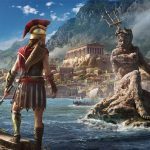 There are plenty of better alternatives that Will and I have reviewed on the Gaming Respawn site, so check some of them out.